There is a 5K race in town every year on the 4th of July, but I’ve never actually run it. Between trips to Nicaragua and various running injuries, its just never worked out. I didn’t really plan on running it this year either. In fact, I hadn’t been giving much thought to anything other than the diets of the North and South Group monkeys (which by the way, do differ despite the fact that these two groups overlapped for practically their entire home range). At any rate, July 4th dawned cool and rainy, which was a nice respite from endless days of blistering hot. The nice weather sealed the deal for me, and I decided to go for it. Besides, Rob was already planning on running the race and I began to realize that I would feel left out if I stayed on the sidelines. I put on my 4th of July outfit (red shorts with a white stripe and a blue tank top—I actually wear this all the time, but July 4th is really the only day it makes any sense), and we ran over to Assembly Hall to do the race. The nice weather had proved to be a lure for over 500 people. I’d never expected it to be so big. I ended up stuck way too far back from the start line, and when the race actually began, I swear it took 5 seconds for me to even begin moving (note: it probably actually didn’t take that long). Even so, I was moving at a snail’s pace for that first stretch up Fourth Street. When we turned onto Florida, I was able to move a little bit more quickly, but still weaving around a lot of slower runners. Even though it wasn’t all that hot and I moving sort of slowly, I began to feel really dehydrated. I wondered if I looked like Lance Armstrong did during that fateful time trial some years ago in the Tour de France. It was a relief when I saw a bunch of volunteers from the running club handing out water. I grabbed a cup and sloshed some water around in my mouth (its hard to actually drink when you’re running as fast as you can), which made me feel a lot better. I was still working to dodge slower people in front of me, but I was nearing a pace that seemed about right to me. It wasn’t until I turned onto Lincoln Avenue (maybe about a mile into the race?) that I actually felt like I was running unencumbered. The race went along the same route as the 4th of July parade, which would begin a couple of hours later. Spectators and carnival-food vendors were already staking out their territories along the parade route. Maybe some of them cheered for us; I’m not quite sure. The only thing I was aware of was the stench of popcorn, fried things, and grilled meat, which made me throw up a little bit in my mouth. The race course was an out an back, so just ahead of the turn-around point, I was able to see the fast runners, including Rob, heading back to the finish. I hit the turn-around at 10:20. (I never saw any mile markers along the course, so it was difficult to judge my pace. Rob assured me though, that there were indeed mile markers). In my heat-addled mind, I began calculating and it seemed to me that I was on world-record pace. This rallied me enough so that I could cheer a couple of friends I met heading out to the turn-around point after I was already on my way back. I had been hoping to have an easier time on the way back, since I reasoned that the wind would be at my back, but it actually felt worse not to have a breeze. I lost a little bit of time, but managed to hold onto it and crossed the finish line in 21.15. I was on cloud 9. For those who recall, the last time I did a 5K, I finished in 21.59, and previous to that, I had never believed I could do it in under 22. I was still elated until I caught up with Rob at the finish line and he eventually told me that his GPS read 3.0 miles—a full 1/10th of a mile too short. Damn. No wonder everybody posts such fast times at this race every year. Seriously, you can check out the results online. Pretty much everybody who does this race is local, and a lot of them are really fast. It always makes me wonder where these people are for the other 364 days of the year because I don’t know very many of them. Rob said that I should stick around for the awards ceremony (“You might have gotten an award: you’re in the old-lady division now”), but I was not interested. Besides, I was afraid I had taken more than my fair share of the post-race watermelon and I should get out of there before eating any more. He decided to stay while I went on home to shower. I ran the 1.25 miles home carrying 3 empty plastic water bottles (I couldn’t bear to throw them in a trash can when they could be recycled) and our race t-shirts (which we had stashed under a tree during the race). I must have looked kind of comical to the throngs of people awaiting the parade, but at least I didn’t have too far to go. 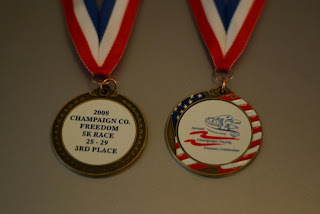 As soon as I had gotten cleaned up, Rob came home with two “Third Place Age-Group Finisher” medals—one for each of us. Nice. 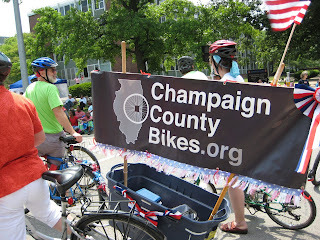 We then took off on Big Red—our tandem bike—to ride with the Champaign County Bikes in the parade. We were a bit late, so it took us a while to find the Champaign County Bikes in the staging area, but eventually it all worked out. During our search for the other cyclists, we saw a wide range of parade floats and participants: everything from marching bands, karate groups, shriners, Champaign County Republicans, and citizens for equal marriage rights (ie, gay marriage). It was pretty fun riding Big Red in the parade, especially because we had just run on this same route just moments ago. After the parade, we came back home briefly and then it was time for the next phase of the festivities: the 32nd Annual Vermont Avenue 4th of July Block Party. Seriously. For the last 32 years, the same dear couple has hosted a block party for the entire neighborhood. I know this house is supposed to be temporary for us, but I can’t help but love it here. This is the kind of real, old-fashioned neighborhood that I didn’t even know existed anymore! Soon after the block party wound down, it was time for the final phase of the 4th of July festivities: the fireworks. The fireworks have always been very close to where our house is now; unfortunately, they’ve recently been moved over to Parkland College (close to where we used to live). We hopped back on Big Red and rode over to a park in our old neighborhood to watch the fireworks. It was lovely. We were far enough away from Parkland that there weren’t throngs of people, but close enough that we still got a great view of the whole thing. The best part was that we were on our bike, so we didn’t have to worry about parking and all that. When the show was over, we rode back home, where we managed to get about 6 hours of sleep before our next adventure: Rob’s triathlon at Mattoon Beach. You can read about that on his blog; he did a really nice job of writing about it. Thanks for reading! Note: I didn't actually read Rob's blog before posting mine, but I think its kind of funny that what we wrote was pretty much the same! I guess that's not too surprising considering we spent the day together! Sounds fun but tiring. Glad we were able to see each other yesterday!